Lemken presented to Agritechnica 2007 its new generation of three row cultivators, the "Karat". This stubble cultivator is intended for intensive soil work and over the entire surface, at depths between 5 and 30 cm depending on the mounted tooling. According to the manufacturer, the symmetrical arrangement of the Karat teeth makes it possible to guide the device without lateral drift whatever the conditions. In addition, the form of teeth was designed to facilitate traction. The differences between lines are between 26 and 28 cm depending on the working width of the cultivator. For the cultivator to penetrate optimally into dry and hard soils, the plow tips have been redesigned. The improved and significantly longer shape of the guide plate (10 cm wide) ensures that the Karat carries out a thorough mixing of the soil and the residues, while remaining very easy to tow and without clogging. To quickly switch from dethatching to deeper soil work and vice versa, a quick changeover device is available as an option on the new Karat. This makes it possible to replace the foot of the complete coulter, including the fin blades, without another tool, by another foot with fins. Behind the teeth, there is a row of starry discs that ensure optimal leveling. The star discs and the follower roller form a single unit, thus dispensing with the adjustment of the discs if the working depth changes. Due to their star-shaped contours, the discs would adapt particularly well to the different working depths. On the semi-worn Karat, the trolley was integrated between the teeth and the star-shaped discs to make the machine as compact as possible. This design also offers more stability and maneuverability at the headland and road transport. Similarly, due to the distribution of the masses, it is also possible to place heavier follower rollers in order to obtain good recovery. 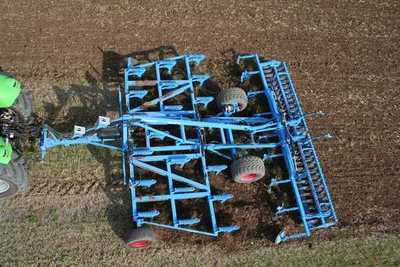 The range variant has also been optimized: to be able to use it with fairly light tractors, the Karat in 5 m wide for example weighs about 500 kg less than the comparable stubble cultivator Lemken Thorit. All Karat are equipped with non-stop safety teeth. The teeth can rise up to 20 cm in contact with an obstacle (triggering force greater than 550 kg). In preparation for the 2008 season, mass production of the new Karat Lemken growers will begin: a 3, 4 and 5 m width version and a 4, 5 and 6 m wide semi-reach version.